Weeknights are super busy! The girls are receiving plenty of homework and projects from school and participating in various extra curricular classes after school. While I’m at work, even if it’s at six in the morning, I am constantly thinking about food and what to cook the girls for dinner. I always think to myself..we’re not going to be home until 6pm today. Should we eat out or should I cook today? What can I cook? If I cook, it’s gotta be quick because Emily has gymnastics today and she’s going to be hungry and want to eat right away after class. What do the kids want to eat? What did they eat yesterday? What do I want to eat? What can I cook that is quick, tasty and packed with veggies? After going through the process of elimination and thinking about what to do for dinner, I find that stir frys always meet the criteria. The longest part of cooking stir frys is the prep work. The actual cooking part takes about five to ten minutes. 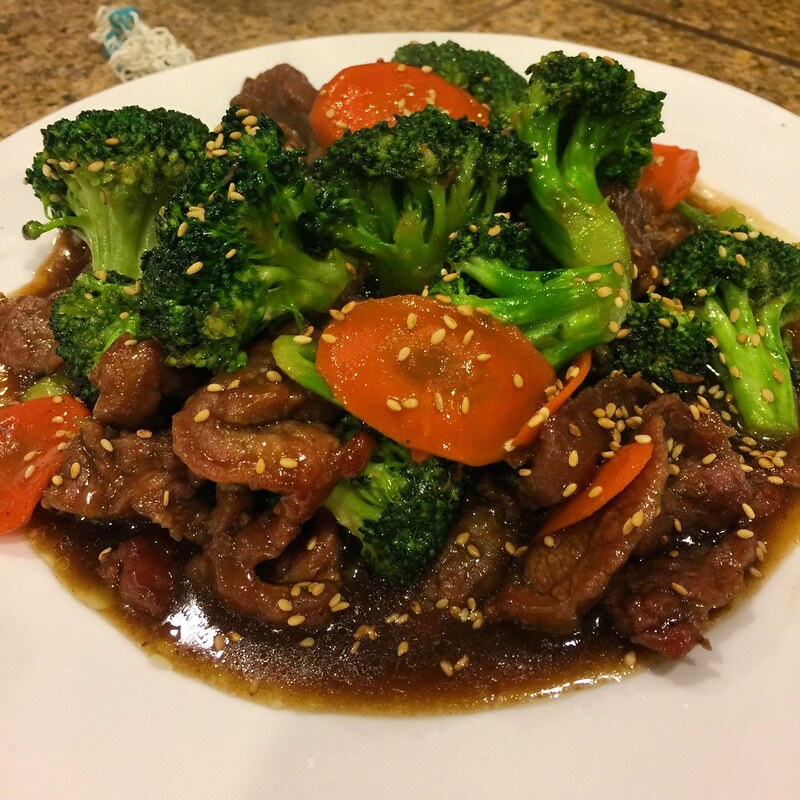 This Beef and Broccoli is a super easy meal to cook. It sure is quick, tasty, and packed with tons of veggies. The veggies is covered in delicious sauce that has a good salty and sweet balance that the girls enjoy. I never have a problem with the girls not eating their veggies when I cook this. Marinate Meat – In a medium bowl, combine beef, soy sauce, rice wine, and corn starch. Mix well and set aside. Marinate for 15-30 minutes. Prepare Sauce – In a small bowl, combine all the sauce ingredients and mix well. Stir Fry – Heat skillet/wok on medium high heat until smoking hot. Add vegetable oil and give skillet/wok a quick swirl. Add garlic and ginger and give a quick stir for about five seconds and add in the marinated meat. Sear meat for about 2 minutes and then stir fry beef until it is no longer red. Add broccoli and carrots and stir fry for an additional 3 minutes. Pour in sauce and stir fry for about another minute or two until the sauce starts to thicken. Transfer to a plate and sprinkle sesame seeds on top. Corn starch is important because it helps lock in juices and flavor of the meat and thickens the sauce like you get from Chinese restaurants.